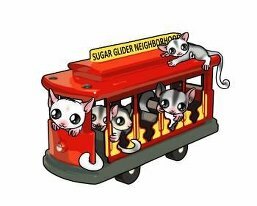 It is no secret that the success of the SUGAR Group's fundraising efforts throughout the year are directly related to the generosity of the amazing vendors in this community. We are so very grateful to each of you who have contributed to our efforts throughout the year, as this directly helps us pay our lab bill each month (which averages $400 per month). We have a lab bill because we subsidize the cost of testing for every single glider tested. These costs add up, and we are asking you to help us continue these efforts by donating to our upcoming fundraising efforts. Each year, the SUGAR Group celebrates the date of our formation with a BIRTHDAY BASH. The Birthday Bash is an online event that includes a few announcements, games, giveaways and auctions. We try to keep the atmosphere light and fun all evening. In addition to the upcoming Birthday Bash, we will be auctioning off a few themed mystery boxes in the coming months. * Donation to the "door prizes" and auctions for those participating from home during the Birthday Bash. Gift certificates are acceptable as are actual prizes. We will put together several auction packages again this year and will also offer a few door prizes. So, anything is game here. * Donation to a MONSTER themed mystery box. Any glider safe item that falls in the theme of "monster" will fit into this box. * Donation to a HALLOWEEN themed mystery box. Any glider safe item that falls within the theme of "Halloween" will go into this box. * Donation of ANY item to our online auctions. These items do not have to be glider items - anything of value is appreciated for these auctions. These auctions will start prior to the Birthday Bash and end during the Event. 1) ANYONE who donates will be listed and thanked on our website. ** Those who donate two items to any of the above will receive a 1/4 page ad. ** Those who donate three or four items to any of the above will receive a 1/2 page ad. *** Those who donate one or more items to all of the above will receive one full page ad. Deadline for donations is OCTOBER 1, 2014. While donations will be accepted after this time, we will not guarantee the ads for any donations that are received after the cut off date (this is the date we will begin working on the slideshow ads and online auctions).